With gratitude for God's blessings, the Augustinians of North America received three more brothers into the Order this August. Fr. Ray Flores, O.S.A. ; Br. Emmanuel Issac, O.S.A. ; and Br. Spencer Thomas, O.S.A., made their first, "temporary," profession of vows to the Augustinians in a Saturday Mass on August 4, 2018 at St. Jude Parish, New Lenox, IL. Midwest Prior Provincial Fr. Tony Pizzo, O.S.A. presided over the liturgy, receiving the vows of Br. Spencer and Fr. Ray. As a friar of the California Province, Br. Emmanuel, who is also a native of Pakistan, professed his vows to Prior Provincial Kevin Mullins, O.S.A.. 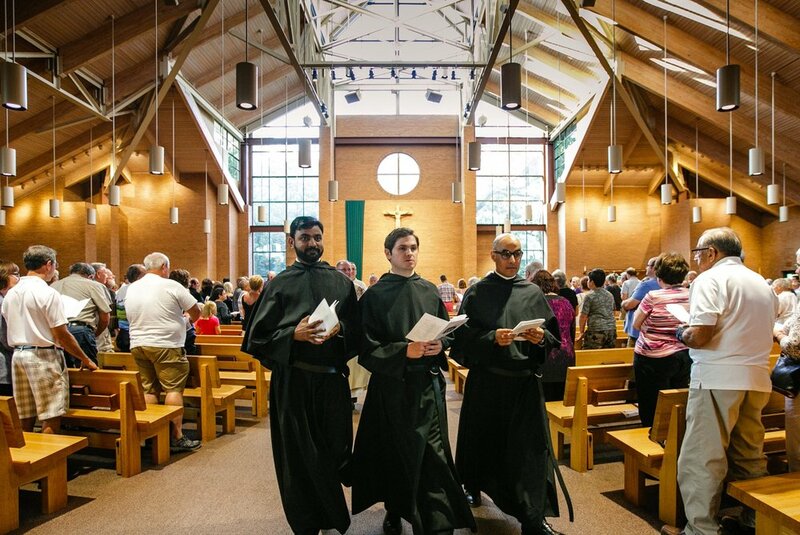 Temporary vows--which are to be renewed annually until the solemn profession of vows—mark the close of the friars’ novitiate, a yearlong period of prayer and contemplation during which men discerning a vocation are introduced to Augustinian community life. Br. Emmanuel and Br. Spencer will begin their graduate studies at the Catholic Theological Union this fall, while Fr. Ray (who joins the Order after 12 years as a diocesan priest in Mew Mexico) will serve as the new Chaplain at St. Rita High School in Chicago. Below is a link to a full gallery of photos to the event as well as condensed slideshow.